Seagate announced their new NAS system, GoFlex Home, today, and it unites the worlds of portable and network storage. Home enables access to the hard drive dock from a wide array of mobile devices, HTPC setups, and networked computers (Windows or OSX). Seagate notes that their propriety software will make setup and use a breeze in each of the aforementioned scenarios. The GoFlex Home system comes in two capacities, 1TB or 2TB, plenty of space to store a wealth of media and provide ample space for backing up your computer. If you have to horde a hefty stash, the system allows for hotswapping of GoFlex Desk drives. You also have the option to connect other devices such as printers or external drives to your network through a USB 2.0 port on the Home dock. GoFlex Desk drives, like the one included in the Home kit, are well known for their ability to connect to USB 2/3, Firewire 800, and eSata ports through cable adapters. Unfortunately, the external connection on the Home dock doesn't reflect this flexible ideal and is limited to the standard USB 2.0 port. Likewise, the dock only supports FlexGo drives as the native hard drive. Seagate hopes that the relatively low cost for the system will convince users that adopting their propriety drives is worth the cost. Honestly though, the dock's intentionally-limited hard drive compatibility is addressed by the external USB port. You aren't limited to their drives, but you are rewarded with speed and ease of use if you choose to stay within the GoFlex realm. It does seem like the system provides a streamlined method for accessing content nearly everywhere in your home. You can access the device with Windows, OSX, smartphones, and DNLA devices like Sony's PlayStation 3. Seagate includes software that claims to ease the pain of syncing your NAS to your content-starved gadgets. Connecting the dock to your network is as easy as connecting the device via ethernet to your wired/wireless router. 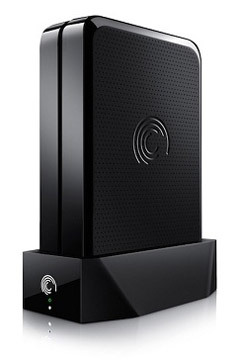 Prices for the system are quite fair at $159.99 (1TB) or $229.99 (2TB). Seagate's GoFlex Home system seems like the a good candidate for anyone interested in tinkering with an NAS setup, while avoiding the typical headaches along the way.